Big colors bouncing around at the Matisse Cut Outs exhibit at MoMA. This exhibit focussed on the paper shapes pinned to the walls of the hotels and studios he lived in France. But what's this? A mermaid and a parrot? Look at the solid blue shapes on either side of the canvas. Could it be possible that the Grand Master had seen the tattoo work of Brooklyn Joe Leiber? Preposterous? No, we say, very possible. It's well known that Brooklyn Joe who, although never actually trod the pavement in Brooklyn, may have visited France or even more likely, one of his human canvasses did. 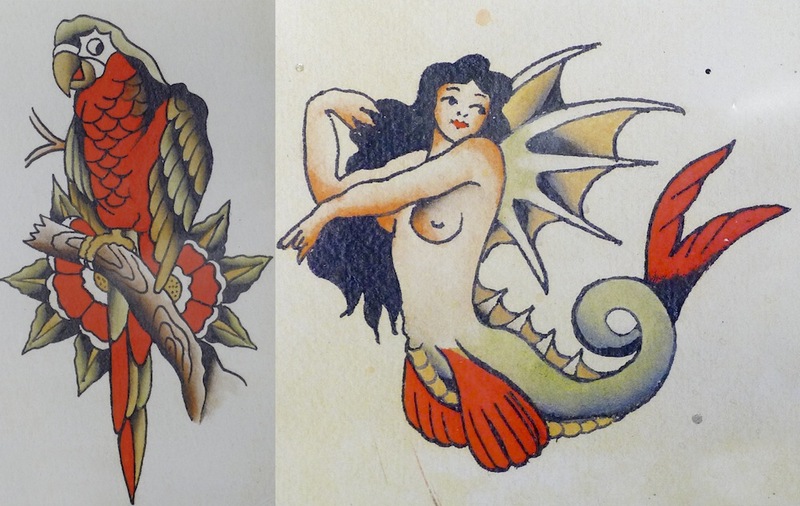 The images and fantasy spread widely with tattooed sailors walking through the ports o'call around the globe. It's a fact that no artist works in a vacuum. Matisse grew up around bolts of wildly patterned fabric in his parents textile business. This translated into his famous abstract pattern style of painting. He most likely saw the stunning tattoo work on sailors while sitting amidst the leafy palms in outdoor cafes where as everyone knows, French artists hang out all day when not banging their many mistresses and girlfriends. More research to follow this exciting discovery.